Thank you for picking up my game! This is my first one, so it's going to be crappy but at least it's fun (I think). Be sure to check out my awesome box art! Play it with your loved ones! Play it with your cat or dog (I heard cats are better at playing Mario) too. Story While strolling around the Mushroom Kingdom, Mario got a message from Bowser. "Dear sneaky plumber, me and my koopa army have stolen Mama Luigi and took over the Mushroom Kingdom! Mama Luigi is in one of my seven koopa hotels. I dare you to find him. Where's your spaghetti now!?" Mario knew he had to fight back. 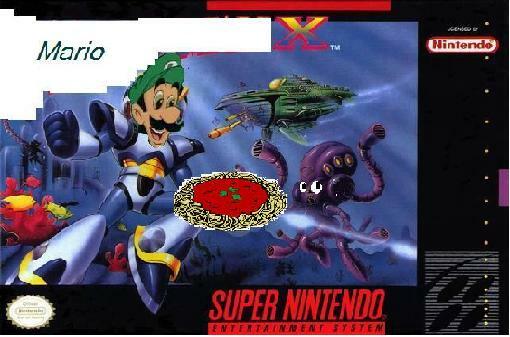 Mega Man X and Zero destroyed all of the koopa hotels, but Weegee teleported them to another dimension (don't worry, they made it out after the game)! now Mario and Yoshi had to do the rest of the work! Credits Gabriel Alexander (me) Autumn Victoria Lunarian Concepts Idol 5 (for that badass Spark Mandrill remix) Gamma V (for that Snazzy Spring Yard remix) You Email me at mzzmzz101@gmail.com or mzzmzz101@yahoo or mzzmzz101@aol for problems, feedback, or death threats (please no). Enjoy!